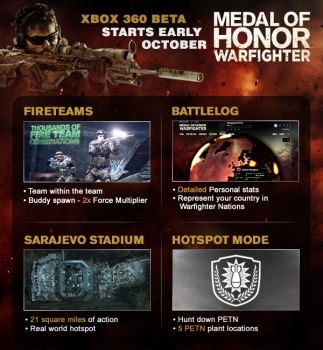 The Medal of Honor: Warfighter multiplayer beta will commence in early October, but only on the Xbox 360. It's not much of a surprise that a multiplayer "beta test" of the upcoming Medal of Honor: Warfighter is in the pipe, but EA has now made it official. A total of 12 Tier One units from ten different nations, including Britain's Special Air Service, Russia's Spetsnaz Alpha Group and the U.S. Navy SEALs, will be available to players as they go head-to-head in online combat. The beta will feature a new multiplayer mode called "HotSpot," in which players pair off in the game's Fireteam mode and conduct attack and defend missions against random locations on the "Sarajevo Stadium" map. The exclamation point on "this year's most authentic military shooter experience" will be Linkin Park's new music video "Castle of Glass," which will feature a mix of live action and gameplay footage. EA says it will release the video five days after the beta begins or when the beta hits three million downloads, so if that sounds like something you want in your life sooner rather than later, then get on with the downloading. Unless you prefer to do your virtual dude-murdering on the PlayStation 3 or PC, in which case you're out of luck; as noted, the beta is reserved exclusively for those of the Xbox 360 persuasion. Medal of Honor: Warfighter comes out on October 23 for the Xbox 360, PlayStation 3 and PC.